GOOD MORNING LADY A.M. SHAKETM is a perfect composition of different forms of protein, designed specifically for all active women who appreciate the delicious taste and unmatched effects. 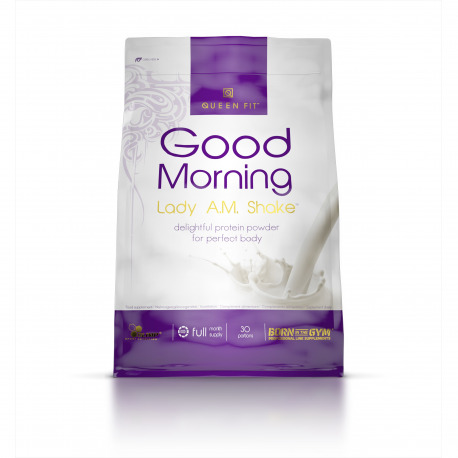 How to use GOOD MORNING LADY A.M. SHAKETM? It's a great-tasting snack - a healthy replacement for desserts and sweets. Forget about feeling guilty once and for all. Now you will be able to drink a delicious, sweet cocktail with the feeling that every sip brings you closer to a great figure! - the basis for perfect mousse - combined with peanut butter for example. The preparation consists of: well absorbed concentrate and whey protein isolate - served in a high concentration, collagen hydrolyzate containing small peptides and micellar casein. Protein helps to maintain muscle mass and to maintain healthy bones. It nourishes the most metabolically active tissues by providing professional support for the body during training, and taking the product does not cause an excessive increase muscle mass! GOOD MORNING LADY A.M. SHAKETM is the best partner in the fight for a dream figure!